This is the lowest form of recognition that was announced. The Mention in Despatches (M.I.D.) for a Soldier is not an award of a medal, but is a commendation of an act of gallantry or service. William Beaumont Alliban’s name would appear in the official report written by a Superior Officer and sent to the high command, in which is described the Soldier's gallant or meritorious action in the face of the enemy. This despatch is published in the London Gazette newspaper of the State, which has existed since 1665 and is still published today. The phrase “Mentioned in Despatches” was used for the first time in a newspaper article by Winston Churchill on 6th October 1898. From the time of the Boer War, the Despatches were published in full or in part. During World War One the citations published in the London Gazette did not usually give details of the place and date of the action for which awarded for security reasons. For most of these you need details from the War Office copy of the gazette. This can enable a search of the unit War Diary which will give a broader picture of the action for which William Beaumont Alliban was awarded the M.I.D. In general no recommendations for Mention in Despatches survive for the army during WW1. A soldier could be mentioned in despatches more than once and in 1919 Army Order 166/1919 confirmed that individuals mentioned would receive a certificate, this included all British forces and Commonwealth Countries. In 1920 the Army Order authorised the issue of an oak leaf emblem decoration to be pinned or sewn diagonally on to the ‘Victory’ medal ribbon. If no campaign medal is awarded, the oak leaf is worn on the left breast of the dress uniform. This would signify that William Beaumont Alliban had been ‘Mentioned in Despatches’. Any photographs? YES - Flickr website & Derbyshire Times. Previously 9, Cross Steet, Chesterfield. Grave location or memoria location No Grave. Thiepval Memorial, Pier & Face 10C 10D and 11A. 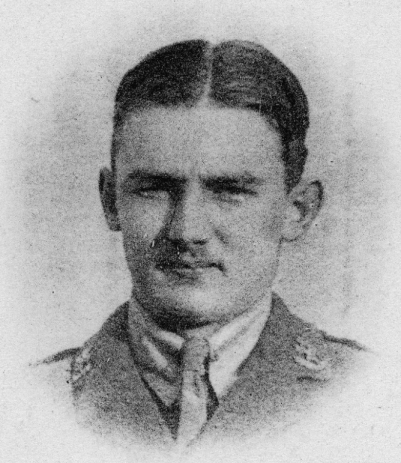 A Territorial in the Inns of Court Officer Training Corps with the nominal rank of Private, he obtained a commission as a Second Lieutenant in the 5th Sherwood Foresters (Notts. 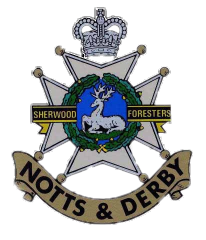 and Derby Regt.) 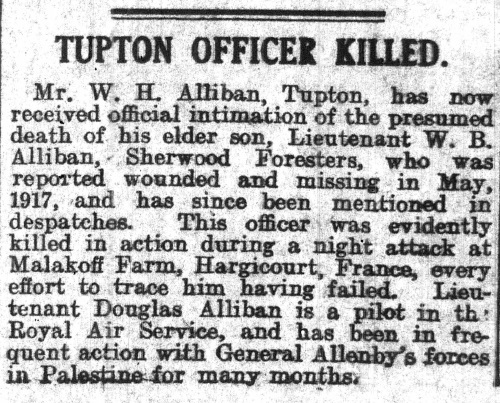 on 11th March 1915. 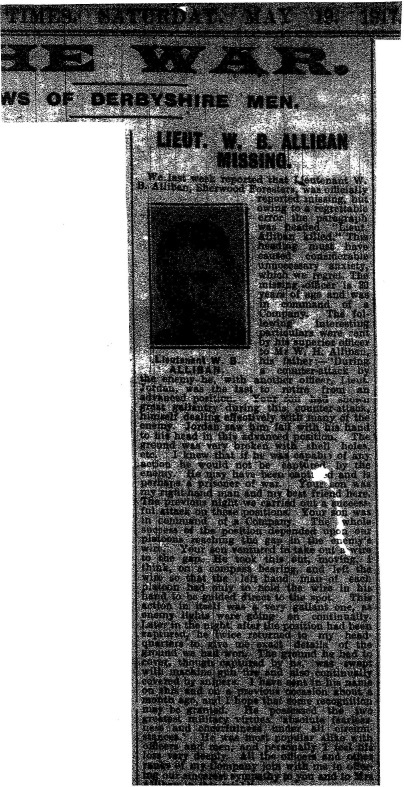 Given the information available it is likely that William Beaumont Alliban was entitled to the Victory medal, also called the Inter Allied Victory Medal. This medal was awarded to all who received the 1914 Star or 1914-15 Star and, with certain exceptions, to those who received the British War Medal. It was never awarded alone. These three medals were sometimes irreverently referred to as Pip, Squeak and Wilfred. 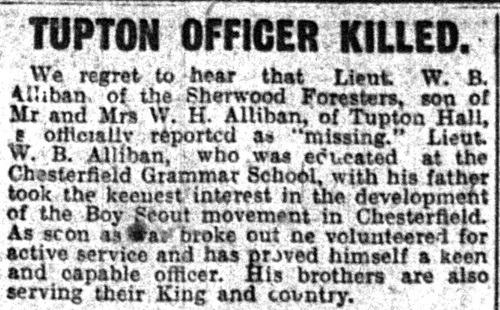 From the information available it is very possible that William Beaumont Alliban was entitled to the British War Medal for service in World War One. This British Empire campaign medal was issued for services between 5th August 1914 and 11th November 1918.